Because of the nature of underground mining operations, providing illumination takes on a critical and mandatory importance that cannot be skimped on or haphazardly addressed. Everything from production to worker safety relies on the presence of effective and reliable lighting, and the quality of the lighting provided can have a significant effect on how well an operation performs. Underground mines represent some of the most difficult work environments to illuminate, and because of conditions such as enclosed spaces, the presence of hazardous materials in the form of flammable gases, vapors and dusts, and the use of heavy machinery, mine lighting must be designed and installed accordingly in order to take these conditions into account. First and foremost in mining operations is the safety of the workers. The underground mining environment is filled with potential dangers that must be adequately illuminated if workers are to effectively note and avoid them. Miners get the majority of their information and cues visually, so illuminating trip and fall hazards such as debris and equipment on the mine floor, pinning and crushing hazards posed by equipment and temporary structures, and long fall hazards from open ground becomes the primary means of addressing safety. Compounding the problem is the difficulty in installing dedicated fixtures, making it more practical to utilize portable and self contained lighting systems. However, although this alleviates the problems associated with installing dedicated lighting systems, portable systems tend to be lowered powered and more limited in their ability to illuminate large areas. Another issue affecting safety and illumination is the age of the worker. The average median age for mine workers is 43 years. Visual acuity decreases with age, and by age 45 a workers eye can lose enough lens clarity and pupil size to reduce the amount of light reaching the retina by 40% as compared to someone 24 years of age. This means it can be more difficult for older workers to notice various hazards and problems with glare may increase. In order to maintain visual acuity in older mine workers, it thus becomes important that lighting levels be kept at high enough levels to compensate, while at the same time taking into consideration the issues with glare that may arise with more powerful light sources. A great deal of study has gone into the effects of mine lighting on safety and worker productivity. The Office of Mine Safety and Health Research has been responsible for much of this study and continues to pursue new information and development towards better mine lighting standards. Of all the lighting methods and technologies currently under study and development, LED lighting technology has demonstrated some of the most promising results. 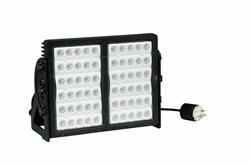 One area where significant developments have occurred have been in portable LED lighting systems, most notably LED cap lamps and LED area lighting. Improvements in visual acuity, productivity, safety, and illumination reliability have been effectively achieved through the testing and design of LED mine lighting systems, and continuing development promises even greater benefits and breakthroughs. One of the reasons for so much emphasis on LED mine lighting has been the need for portable lighting systems powerful enough to provide stronger illumination for older eyes that will not cause an excessive drain on portable power sources. The extreme efficiency and low power requirements of LEDs makes them an almost ideal candidate for portable lighting systems, which when considered along with their high durability and compact size further cements attention on them. Particular focus has been placed on cap lamps and machine mounted lighting systems, as these two areas represent some of the most commonly utilized light sources in underground mining operations. Of particular interest is the finding by the Office of Mine Safety and Health Research that lighting with a shorter spectral wavelength produced better results than longer wavelength light sources. This is interesting because LEDs generally tend to produce more of their light in the longer wavelength end of the light spectrum. Their studies showed significant improvements with special short wavelength LED cap lamps over standard cap lamps and incandescent light sources with persons an average of 50 years old, including 23.7% faster detection of floor hazards, 15% faster detection of peripheral motion, and an over 50% reduction visual difficulties with glare. Additionally, their studies showed an over 60% improvement in energy efficiency, in effect showing that LEDs can not only improve light quality and effectiveness, but provide more reliable operation and far longer run times from a portable power source. LED mining lights also showed significant promise in real hazard situations, improving hazard identification and visual response times significantly. Subjects were up to 70% better able to note the movement of continuous mining machines as well, and showed increased response time and thus increased time elapsed versus actual machine movement. This kind of improvement can then be easily translated into a better ability to avoid pinning and crushing hazards, as the worker is noting machine movement while it has covered less ground compared to standard incandescent and cap lamps. On average, workers were able to notice movement 1.5 feet sooner than with conventional light sources. Because of results such as these and the improvements associated with the inclusion of LEDs into portable mine lighting systems, their use has seen a significant growth as owners and operators of mining operations realize their available potential. With LEDs also being fitted to explosion proof and vapor proof fixtures with equally successful results (also of extreme importance in mining operations), it is likely that the near future will see LEDs become the dominant form of mine lighting rather quickly, and remain so for the far reaching foreseeable future.